Several years ago, we completed a website revenue study focusing on small websites. The goal of this study was to understand how much a typical site should make. We accomplished this by looking at 100 websites listed for public auction at a major site. We recently ran an update on this study to understand how the sites were doing today. What % of the sites were still online and indexed by Google? Has the site gotten better or worse since the sale (using competitor analysis tools)? Of our original 100 sites, 93 were in a position to be effectively tracked using 3rd party competitive research tools such as SEMrush. The remaining sites got a hall pass; these had been executed as confidential sales (no site name), where we vetted the site anonymously and were unable to find them for a follow-up. Since a basic due diligence review was run on every site included in the study, we are comfortable that each of the sites was operating as a legitimate business at the time of the sale – although many were “window dressing” from a SEO and traffic generation perspective to boost their statistics. Survival rates on large deals were encouraging, with over 75% of the sites operating as viable businesses three years since the start of the auction. As we will see later, some were up, some were down, but most of them were still there. This is very competitive with other small business opportunities. Failure rates were brutal for the small deals, running 3.6 x higher for deals priced under $5,000 than deals priced over $25,000. The issue appears to be driven by deal size rather than quality of the site; this problem was consistent across different subgroups within this population – regardless of other factors that would generally be considered positives. We dug into this issue further, breaking out the sites based on the buyer’s price as a multiple of the site’s monthly revenue. Financial multiples are regularly used by the investment banking industry as a rough measure of the company’s future prospects. Under this approach, websites with clean SEO histories and a solid business proposition should be priced as if they would generate earnings for several years; sites with sketchy backgrounds will be priced to ensure the investor got their money back in a few months. The reality was a bit more muddled. This theory worked fairly well for large and medium sized websites – you definitely “get what you pay for” in this market. Anything priced at a low multiple of revenue (low single digits) tended to perform very poorly; sane people don’t sell websites at three month’s earning unless they expect the site to come crashing down. 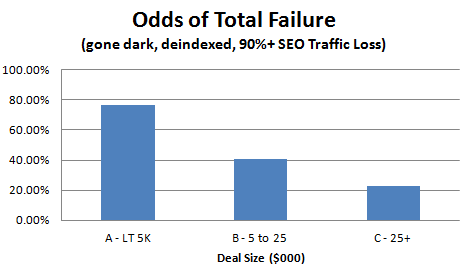 For small deals (<$5K), high and low multiple websites had similar failure rates, indicating the root cause likely lay elsewhere. A second factor we examined was the bidding competition in the auction, measured by the number of bids received. We theorized this would serve to validate the site’s history and business model – that sites which could inspire aggressive bidding were more likely to be free of issues. This metric proved to be of marginal value – sites with intense auctions performed similarly to sites with relatively quiet ones. Finally, we looked at the site’s traffic profile prior to the sale. 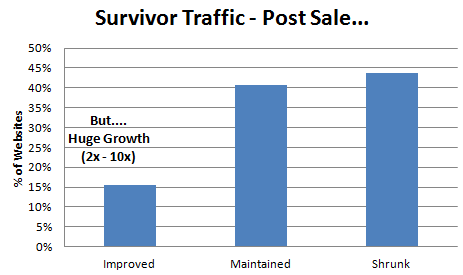 Rapid growth in traffic immediately prior to the sale is considered a huge red flag, potentially indicating the prior owner has been engaging in aggressive SEO tactics with a high risk of future penalties. What we discovered was this issue had usually already been discounted in the valuation; sites with this profile were priced about 30% below their more stable peers and none of the sites in our sample that fit the profile were able to command over $25,000 at auction. Within the small deal sample, the “rapid growth” actually performed slightly better than the sites with stable history (77% vs 84%), although neither group did particularly well. In fairness to the “failed” sites, a handful would potentially have salvage value or provide an opportunity to recoup the buyer’s investment. The average valuation of the failed small website was 8 x monthly revenues. While most sites crashed within months, a few held out for a year – providing opportunities to break even. For sites with meaningful PageRank, there is an opportunity to help other sites in the new owner’s portfolio with relevant links. We are left with the suspicion that the failure rate on small deals is as much a factor with the buyer as the seller or site; writing a large check generally requires you to know what you are doing and be willing to go the distance to get the money back. These larger deals were more likely to survive because their owners were less willing to let them fail. First, the natural bias of the web is towards decay – only about 15% of the surviving sites experienced significant growth in the years following the sale. There was a near even split between sites holding their position and experiencing a significant decline (50%+ traffic). Granted this is priced into the valuations – the typical site in the sample we took was sold for 10 x monthly earnings, which is far lower than a regular small businesses (1 – 5 years of earnings) or the typical public company (12 – 25 years of earnings). The goal should be to ensure you’re harvesting cash at an appropriate rate and reinvesting it in other projects. And growth, when it happens, can be spectacular. Several of the sites in that 15% slice had 10 x improvements in traffic as the site gained search rank or build their audience. The gains of these sites would likely have offset most/all of the losses at the other sites; the trick is getting one of them in your portfolio. Thus there’s value in making many good bets if you can successfully identify a way to diversify your risk; going back to the prior section, avoid stuffing the portfolio with cheap deals. The blogs in our sample tended to be steady earners, with one of the lowest overall failure rates. This was particularly true for well established blogs ($5+ deal value); most of them maintained or grew their traffic and there were few total failures (25%). Links from these sites to other sites in the new owner’s portfolio were likely helpful. Other content sites were very sensitive to size; small content sites did poorly (80% failure rate), larger sites performed relatively well. This was somewhat reflected in the valuations, which were at a premium to blogs (13 x – 20 x vs. 10 x); these sites also likely had lower writing support costs due to greater use of evergreen content. The E-commerce and Product/Script sites within the sample had a high failure rate. This was predicted by the valuations (4 – 8 x monthly revenue, for the failed sites), indicating most of these were already identified as problematic at the time of sale. Lack of business traction is a likely issue – given that successful sites in this space should be coining money, most of the sites listed at the price point included in this study were marginal players in their market. Stronger sites should perform better. 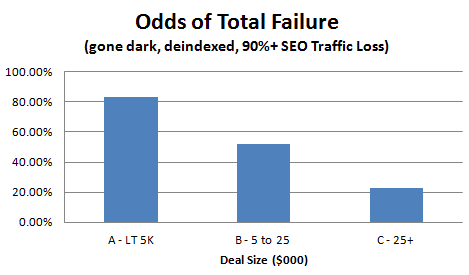 Any business touching SEO should be considered high risk. Every SEO Services site in the sample failed; most of the content sites which incorporated paid links or article sponsorship also did poorly. Investments in this space should be positioned to handle Google’s algorithm and policy changes to stay ranked and relevant. In retrospect, this sample is heavily skewed towards the lower end of the market. Public auction is a fairly blunt way to liquidate an investment. Many of the higher quality, higher value sites are moved through brokers and private sales, frequently to strategic buyers seeking to build a collection of properties that can support each other. As the quantity and quality of a website’s revenue and traffic increases, a more motivated set of buyers arrive who are willing to pay higher valuations. The $25,000 deals attracted a stronger audience and gave them a stronger business to operate, that produced superior results. This trend likely continues as the value of the website increases. In conclusion, traction appears to create traction on the web. The larger sites in a niche tended to do well – staying in business and sometimes growing. Small sites have a rough time of it; particularly if they grew very quickly. The micro-site environment appears to be kinder to blog and content businesses than product / services offerings. From a website investment viewpoint, these findings point towards having some courage and pursuing larger sites at higher valuations. For someone with $25,000 – $50,000 to put into the effort, these statistics imply you would be better served buying 1 – 2 high quality sites at a market-competitive multiple (15 – 20 x monthly earnings) than pursuing multiple small projects in the $5,000 range (regardless of pricing). And for those of you building your projects organically, getting your project’s fair market value north of $25,000 has benefits beyond simple financial growth in terms of market presence and commitment.